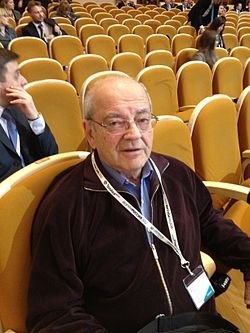 Dmitry Zimin is a Russian businessman who founded Beeline, one of Russia's largest mobile phone networks.,and in 2002 went on to set up the philanthropic Dynasty Foundation. Dynasty Foundation focused its work on supporting Russia's science and scientists. On 25 May 2015 the Dynasty Foundation was designated as a 'foreign agent' NGO by the Ministry of Justice. Dmitry Zimin was quoted by the journal Snob as saying: 'Of course we never were [a foreign agent] and never will be, it would be better for us to close down.' Subsequently over 3,000 scientists and members of the public signed an open letter demanding that the ministry of justice rescind its decision. On 6 June reports said 1,500 people gathered in Moscow to protest against the ministry's action. However, when the ministry of justice refused to change its stance, Dynasty Foundation decided to close down, issuing a brief statement on 5 July to that effect on its website.